The jBPM 7 release will include an integrated security management solution to allow administrator users to manage the application’s users, groups and permissions using an intuitive and friendly user interface. Once released, users will be able to configure who can access the different resources and features available in the workbench. Users can be assigned with more than one role and/or group. It is always mandatory to assign at least one role to the user, otherwise he/she won’t be able to login. Roles are defined at application server level and they are defined as <security-role> entries in the application’s web.xml descriptor. On the other hand, groups are a more flexible concept, since they can be defined at runtime. Both can be used together without any trouble. Groups are recommended as they are a more flexible than roles. As you can see, a permission is a resource + action pair. In the concrete case of a perspective we have: read, update, delete and create as the actions available. That means that there are four possible permissions that could be granted for perspectives. Permissions do not necessarily need to be tied to a resource. Sometimes it is also neccessary to protect access to specific features, like for instance "generate a sales report". That means, permissions can be used not only to protect access to resources but also to custom features within the application. The set of permissions assigned to every role and/or group is called the authorization (or security) policy. Every application contains a single security policy which is used every time the system checks a permission. The authorization policy file is initialized from a file called WEB-INF/classes/security-policy.properties under the application’s WAR structure. NOTE: If no policy is defined then the authorization management features are disabled and the application behaves as if all the resources & features were granted by default. Every entry defines a single permission which is assigned to a role/group. On application start up, the policy file is loaded and stored into memory. The Security Management perspective is available under the Home section in the workbench's top menu bar. All of the above together provides a complete users and groups management subsystem as well as a permission configuration UI for protecting access to some of the workbench resources and features. Unlike users and groups, roles can not be created nor deleted as they come from the application’s web.xml descriptor. NOTE: User & group management features were described in detail in this previous article. 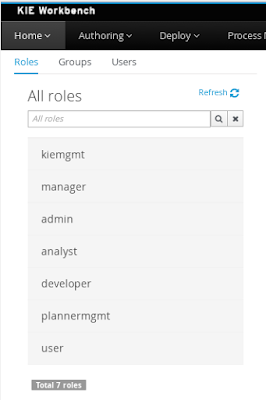 After clicking on a role in the left sidebar, the role editor is opened on the screen’s right, which is exactly the same editor used for groups. The above editor is used to set several security settings regarding both roles and groups. This is the perspective where the user is directed after login. This makes it possible to have different home pages for different users, since users can be assigned to different roles or groups. It is used to determine what settings (home perspective, permissions, …​) have precedence for those users with more that one role or group assigned. Without this setting, it wouldn’t be possible to determine what role/group should take precedence. For instance, an administrative role has higher priority than a non-administrative one. For users with both administrative and non-administrative roles granted, administrative privileges will always win, provided the administrative role’s priority is greater than the other. Currently, the workbench support the following permission categories. Workbench: General workbench permissions, not tied to any specific resource type. Perspectives: If access to a perspective is denied then it will not be shown in any of application menus. Update, Delete and Create permissions change the behaviour of the perspective management plugin editor. Organizational Units: Sets who can Create, Update or Delete organizational units from the Organizational Unit section at the Administration perspective. Sets also what organizational units are visible in the Project Explorer at the Project Authoring perspective. Repositories: Sets who can Create, Update or Delete repositories from the Repositories section at the Administration perspective. Sets also what repositories are visible in the Project Explorer at the Project Authoring perspective. Projects: In the Project Authoring perspective, sets who can Create, Update, Delete or Build projects from the Project Editor screen as well as what projects are visible in the Project Explorer. For perspectives, organizational units, repositories and projects it is possible to define global permissions and add single instance exceptions afterwards. For instance, Read access can be granted to all the perspectives and deny access just to an individual perspective. This is called the grant all deny a few strategy. NOTE: In the example above, the Update and Delete permissions are disabled as it does not makes sense to define such permissions if the user is not even able to read perspectives. Every time the ACL is modified from the security settings UI the changes are stored into the GIT repo. Initially, when the application is deployed for the first time there is no security policy stored in GIT. However, the application might need to set-up a default policy with the different access profiles for each of the application roles. The above is an auto-deploy mechanism which is used in the workbench to set-up its default security policy. One slight variation of the deployment process is the ability to split the “security-policy.properties” file into small pieces so that it is possible, for example, to define one file per role. The split files must start by the “security-module-” prefix, for instance: “security-module-admin.properties”. The deployment mechanism will read and deploy both the "security-policy.properties" and all the optional “security-module-?.properties” found on the classpath. Notice, despite using the split approach, the “security-policy.properties” must always be present as it is used as a marker file by the security subsystem in order to locate the other policy files. This split mechanism allows for a better organization of the whole security policy. Uberfire provides a complete API around permissions. 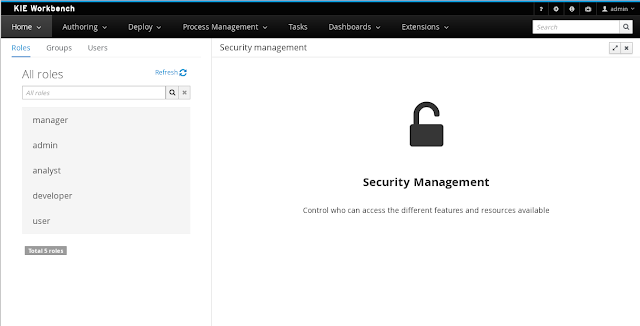 The AuthorizationManager is the main interface for checking if permissions are granted to users. The security check calls always use the permissions defined in the security policy. For those interested in those APIs, an entire chapter can be found in the Uberfire's documentation. The features described above will bring even more flexibility to the workbench. Users and groups can be created right from the workbench, new assets like perspectives or projects can be authored and, finally, specific permissions can be granted or denied for those assets. In the future, along the improvement of the authoring capabilities more permission types will be added. The ultimate goal is to deliver a zero/low code, very flexible and customizable tooling which allows to develop, build and deploy business applications in the cloud.